Imagine calling the family to breakfast on a crisp holiday morning with the aroma of cob-smoked, thick sliced bacon filling the house. Then, consider the rave reviews you will hear when they experience the flavor of the "World's Best Cheddar" aged to perfection for a creamy yet snappy zing only natural aging can create. The crowning touch is everyone's favorite - baby back ribs in barbecue sauce. 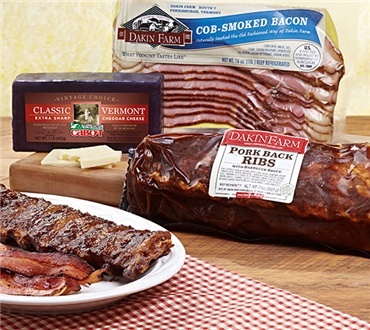 I have been buying from Dakin Farm since 1968. Absolutely the best bacon, some of the best ribs I've ever had and the Cabot cheeses are excellent! They were so DELICIOUS>>> Will definitely. uy again. Easy to prepare. Very tasty.